The peripatetic Benjamin Cole, a frequent and valued commenter on this and many other blogs, wrote a guest post the other day on Marcus Nunes’s blog, putting the current “sound money” rhetoric emanating from the self-appointed heirs to Ronald Reagan’s political legacy in proper historical perspective. An important public service and a must read. Kudos to Benjamin and to Marcus. The advance estimate of GDP for the first quarter of 2012 published today provides little cause for celebration, and not much reason for hope. Real GDP growth slowed to a 2.2% annual rate from the 3.0% rate in the previous quarter. Nominal GDP growth remained at 3.8%, reflecting a spike in oil prices as a result of nervousness about disruptions in oil supplies from the Persian Gulf. But despite the lackluster performance, Ben Bernanke no doubt feels well satisfied, as this answer, responding to criticism from Paul Krugman, from his press conference after this week’s FOMC meeting, demonstrates all too clearly. So there’s this, uh, view circulating that the views I expressed about 15 years ago on the Bank of Japan are somehow inconsistent with our current policies. That is absolutely incorrect. My views and our policies today are completely consistent with the views that I held at that time. I made two points at that time. To the Bank of Japan, the first was that I believe a determined central bank could, and should, work to eliminate deflation, that it’s [sic] falling prices. The second point that I made was that, um, when short-term interest rates hit zero, the tools of a central bank are no longer, are not exhausted there, are still other things that, um, that the central bank can do to create additional accommodation. Now looking at the current situation in the United States, we are not in deflation. When deflation became a significant risk in late 2010 or at least a moderate risk in late 2010, we used additional balance sheet tools to return inflation close to the 2% target. Likewise, we’ve been aggressive and creative in using nonfederal funds rate centered tools to achieve additional accommodation for the U.S. economy. So the, the very critical difference between the Japanese situation 15 years ago and the U.S. situation today is that, Japan was in deflation and clearly, when you’re in deflation and in recession, then both sides of your mandate, so to speak, are demanding additional deflation [sic]. Why don’t we do more? I would reiterate, we’re doing a great deal of policies extraordinarily accommodative. You know all the things we’ve done to try to provide support to the economy. I guess the, uh, the question is, um, does it make sense to actively seek a higher inflation rate in order to, uh, achieve a slightly increased pace of reduction in the unemployment rate? The view of the committee is that that would be very, uh, uh, reckless. We have, uh, we, the Federal Reserve, have spent 30 years building up credibility for low and stable inflation, which has proved extremely valuable, in that we’ve been able to take strong accommodative actions in the last four or five years to support the economy without leading to a, [indiscernible] expectations or destabilization of inflation. To risk that asset, for, what I think would be quite tentative and, uh, perhaps doubtful gains, on the real side would be an unwise thing to do. Paul Krugman responded on his blog to this not very edifying answer by Mr. Bernanke; Krugman pointed out that the sharp distinction between the situation in Japan and the situation in the US is not as clear cut as Bernanke makes it out to be. Moreover, there is no basis for saying that there is a bright line between positive and negative inflation so that the economic effects change radically when you go from very low positive inflation to very low negative inflation. I would make a further comment on Bernanke’s performance. 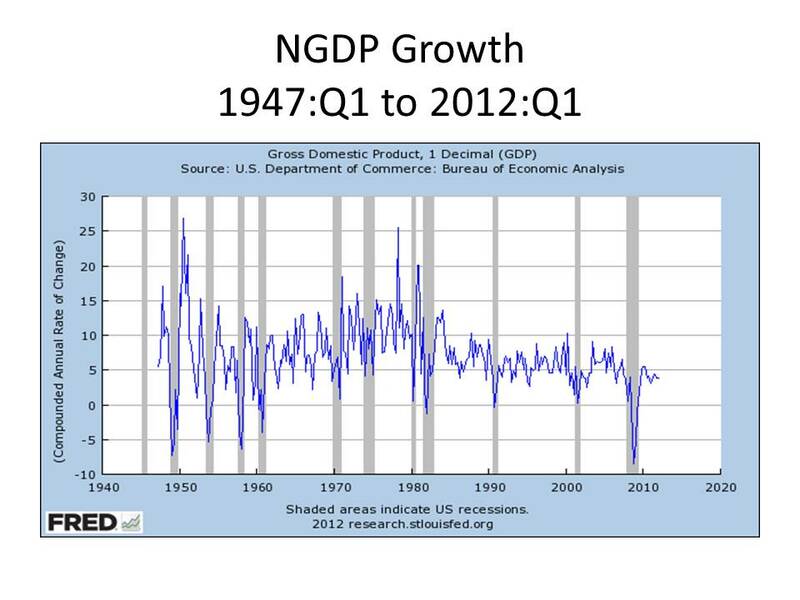 Since 1947, every single recovery has been associated with several quarters of nominal GDP growth in excess of 5% as the chart below demonstrates. 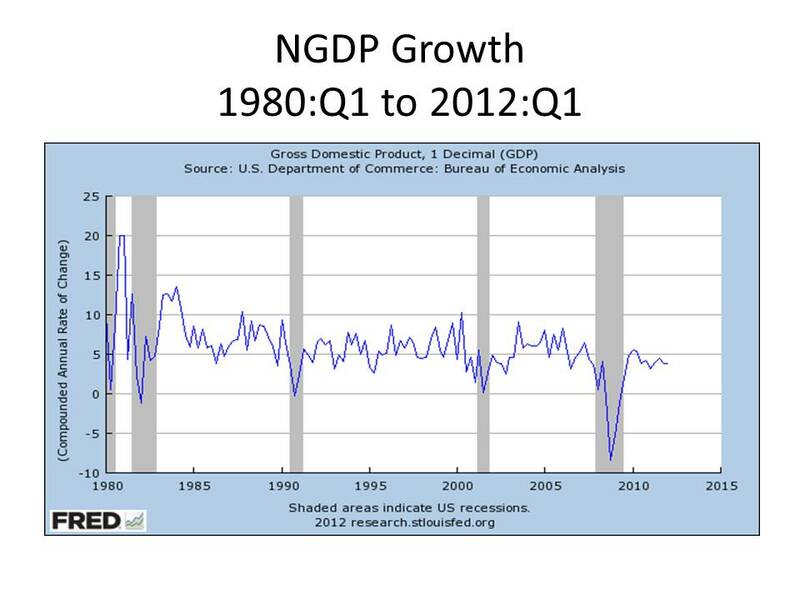 The only recovery in which nominal GDP growth did not initially exceed 5% for several quarters was the anemic recovery from the 2001 recession in which nominal GDP growth remained under 5% for several quarters before increasing above 5%, but only slightly above 5%. With what passion does Mr. Bernanke invoke the experience of the past 30 years during which the Federal Reserve, has patiently “built up its credibility for low and stable inflation,” credibility that “proved extremely valuable” in enabling the Fed “to take strong accommodative actions in the last four or five years to support the economy without leading to . . . expectations or destabilization of inflation.” Well, I am deeply moved by Mr. Bernanke’s deeply pious reverence for the lessons of the last 30 years, but let’s have a little closer look at the record of the last 30 years in the next chart. And what does the chart show? It shows over the past 30 years in which the Fed has built up so much credibility that the Fed has been able to do all the wonderful things that it has done to promote . . ., well, to promote the weakest recovery since World War II, nominal GDP growth after each recession during the past 30 years substantially exceeded 5% quarter after quarter. During this recovery, however, the annual rate of nominal GDP growth has not exceeded 5.5% in any quarter since the “recovery” began, while averaging less than 4%. And Mr. Bernanke has the nerve to tell us that he is unwilling to allow inflation to increase above 2% because it would squander the precious credibility achieved by the Fed over the past 30 years when nominal GDP during recoveries almost always grew at an annual rate greater, often substantially greater, than 5%? Remember the audacity of hope? This is the audacity of complacency and indifference. P. H. Wicksteed has a strong claim to having been the greatest amateur economist in the history of our subject. By profession, he was a Unitarian minister, theologian, classicist, medievalist, perhaps the foremost Dante scholar of his time, translator of the Inferno, who was inspired to the study of economics and later mathematics by his reading of Henry George which led him to study William Stanley Jevons’s Theory of Political Economy. Wicksteed’s claim to having been the greatest economist in the history of our subject is somewhat weaker, but only somewhat. Wicksteed was the first economic imperialist, the first economist to take seriously the notion that economic theory in the form of marginal utility analysis could explain supposedly non-economic behavior, providing a coherent statement of the idea that all rational goal-oriented action could be anlayzed using economic theory, thereby giving a very different interpretation to the term “homo economicus” from the way it had previously been understood. In that sense, Wicksteed anticipated the ideas of both Ludwig von Mises and Gary Becker. What is less well known is that Wicksteed discovered and stated the Coase Theorem, or at least the key lemma required to prove the Coase Theorem 46 years before Coase first published the theorem in his 1959 article on the Federal Communications Commission. Wicksteed’s anticipation of the Coase Theorem appeared in a celebrated essay “The Scope and Method of Political Economy in the Light of the “Marginal” Theory of Value and Distribution.” The proposition that Wicksteed proved is well known: that there is no supply curve. But what about the “supply curve” that usually figures as a determinant of price, co-ordinate with the demand curve? I will say it boldly and baldly: There is no such thing. What does this have to do with the Coase Theorem? Read on. For it will be found on a careful analysis that the construction of a diagram of intersecting demand and “supply” curves always involves, but never reveals, a definite assumption as to the amount of the total supply possessed by the supposed buyers and sellers taken together as a single homogenous body,and that if this total is changed the emerging price changes too; whereas a change in its initial distribution (if the collective curve is unaffected, while the component or intersecting curves change) will have no effect on the market, or equilibrating price itself, which will come out exactly the same. Naturally, for neither the one curve nor the one quantity which determine the price has been changed. There you have the Coase Theorem: a competitive equilibrium is independent of the initial allocation (given, as Wicksteed implicitly assumed, zero transactions costs). What Coase added was the insight that what is being traded when people engage in exchange is not physical commodities but rights to those commodities, so that the our conception of the process of exchange should be expanded to include the exchange of rights to engage in certain kinds of action, say, the emission of smoke or other nuisances. All this is by way of introduction to the following lengthy excerpt from Book II, Chapter 7 of Wicksteed’s magnum opus, The Common Sense of Political Economy in which Wicksteed analyzed the role of the government in conferring value on so-called fiat money. Although Wicksteed was through and through a neo-classical economist, he provided the most elegant and comprehensive statement of the theory, nowadays generally associated with Modern Monetary Theorists and usually traced back to Georg Friedrich Knapp’s State Theory of Money. Nick Rowe mentioned Wicksteed in a post yesterday as the source for the theory that acceptability as payment for taxes is what allows fiat money to have value, but didn’t provide a source. Although the quotation is rather long, it is such a powerful piece of analysis that I thought that it deserves to be quoted in full. If we now turn to paper currencies, again, we shall remodel the statement thus: It is not true that a government can confer on pieces of paper, or other intrinsically worthless articles, the collective power of doing the business of the country, but it can within certain limits confer a defined power of doing business on certain pieces of printed paper. For the government, as general guardian of contracts and of property, has the power to enforce or to decline to enforce any contracts, and as guardian of the rights of property it can determine whose property anything shall be. It is possible, then, for a Government at any time to say: “There are in this country a number of persons under legal obligation to pay fixed rents for premises, fixed interest on capital, fixed salaries for services, over such periods as their several contracts cover. There are also a number of persons under definite obligations to pay such and such gold, at such and such dates, once for all. Now we, the Government, can, if we like, issue stamped papers bearing various face denominations of one, ten, a hundred, etc., units of gold currency, and we can decree that any one who possesses himself of such papers, to the face value of his debts, and hands them over to his creditor shall be held to have discharged his debt, and we will henceforth defend his property against his late creditor and declare that he has, in the eye of the law, paid the sum of gold which he owed.” It is obvious that these pieces of paper will thereby acquire definite values to all persons who are under obligation to discharge debts or to pay salaries or rents or other sums due under contract; for to command one of these pieces of paper will be, for certain of their purposes, exactly equivalent to commanding a sovereign. As these persons constitute a large and easily accessible portion of the community, there will at first be no difficulty whatever in circulating the notes, for those who have no direct use for them themselves will know that there are plenty of people who have, and a certain number of these certificates can, in this way, be floated. Each will be able to transact business to the same extent as a piece of gold of its face value. But as the contracts gradually expire and the debts are gradually discharged, the original force that gave currency to the Government’s paper will become exhausted. At first the holder of such a bond will from time to time come across men who will say: “Oh, yes, I was just looking out for paper in order to discharge my debt or pay my rent”; and if there were the smallest tendency to depreciation, competition would instantly rise amongst these persons who would be glad to get, at any reduction whatever, these things which their creditors would be compelled to receive at full value. If people chose to go on making fresh contracts and giving fresh credit, without specifying that the payment should be in gold, and thus went on perpetually bringing themselves under legal obligation to receive paper in full payment, the process might go on for a certain time, by its own impetus, but there would be nothing to compel any one to enter into such a contract; and if at any time, for any reason, there were a slight preference for making contracts in gold, so that there was a dearth of people of whom it could be definitely asserted that for their own immediate purposes, independent of the general understanding, the paper was worth the gold, there would obviously be no firm basis for the structure, and every one would become nervous and would want to make some allowance for the risk of not finding any one who would take the paper at or near the face value. The Government has, however, a further resource. It has the means of maintaining a perpetual recurrence of persons thus desiring money at its face value, for the Government itself has more or less defined powers of taking the possessions of its subjects for public purposes, that is to say, enforcing them to contribute thereto by paying taxes. Ultimately it requires food, clothing, shelter, and a certain amount of amusement and indulgence for its soldiers and all its officials; and it requires fire-arms, ammunition, and the like. And in proportion to its advance in civilization it may have other and humaner purposes to fulfil. Now, as long as gold has any application in the arts and sciences it exchanges at a certain rate with other commodities, just as oxen exchange at a certain rate against potatoes, pig-iron, or the privilege of listening, in a certain kind of seat, to a prima donna at a concert. The Government, then, levying taxes upon the community, may say: “I shall take from you, in proportion to your resources, as a tribute to public expenses, the value of so much gold. You may pay it to me in actual metallic gold or you may pay it to me in anything which I choose to accept in lieu of the gold. If you do not give it me I shall take it from you, in gold or any other such articles as I can find, and which would serve my purpose, to the value of the gold. But if you can give me a piece of paper, of my own issue, to the face value of the gold that I am entitled to claim of you, I will accept that in payment.” Now, as these demands of the Government are recurrent, there will always be a set of persons to whom the Government paper stamped with a unit weight of gold is actually equivalent to that weight of gold itself, because it will secure immunity from requisitions to the exact extent to which the gold would secure it. This gives to the piece of paper an actual power of doing the work that gold to its face value could do, in the way of effecting exchanges; and therefore the Government will find that the persons of whom it has made purchases, or whom it has to pay for their services, will not only be obliged to accept the paper in lieu of payments already due, and which it chooses to say that these papers discharge, but will also be willing to enter into fresh bargains with it, to supply services or to surrender things for the paper, exactly as if it were gold; as long as it is easy to find persons who, being themselves under obligation to the Government, actually find the Government promise to relinquish their claim for gold as valuable as the gold itself. The persons who pay taxes constitute a very large portion of the community and the taxes they have to pay form a very appreciable fraction of their total expenditure, and consequently a very large number of easily accessible persons actually value the paper as much as the gold up to a certain determined point, the point, to wit, of their obligations to the Government. Thus it is that a limited demand for paper, at its face value in gold, constitutes a permanent market, and furnishes a basis on which a certain amount of other transactions will be entered into. The Government, in fact, is in a position very analogous to that of an issuing bank. An issuing bank promises to pay gold to any one who presents its notes, and to a certain extent that promise performs the functions of the gold itself, and a certain volume of notes can be floated as long as the credit of the bank is good. Because bank promises to pay are found to be convenient, as a means of conducting exchanges. After this number has been floated the notes begin to be presented at the bank, and presently it has to redeem its promises as quickly as it issues them. The limit then has been reached and the operation cannot be repeated. After this people will decline to accept the promises of the bank in lieu of the money, or, which is the same thing, they will instantly present the promise and require its fulfillment. The amount of notes in circulation may be maintained, but it cannot be increased. The issuing Government does not, without qualification, say that it will pay gold to any one who presents the note, but, in accepting its own notes instead of gold, it says, in effect, that it will give gold for its own notes to any of its own debtors; and as long as there is a sufficient body of these debtors to vivify the circulating fluid the Government can get its promises accepted at par. Any Government which, even for a short time, insists on paying in paper and receiving in gold, that is to say, any Government that does not honour its own issue when presented by its debtors, will find that its subjects decline to enter into voluntary contracts with it except on the gold basis; and if its paper still retains any value whatever, it will only be because of an expectation of a different state of things hereafter that gives a certain speculative value to the promise. In fact a Government which refuses to take its own money at par has no vivifying sources to rely on except the very disreputable and rapidly exhausted one of proclaiming to debtors, and persons under contract to pay periodic sums, that they need not do so if they hold a certificate of immunity from the Government. Such immunity will be purchased at a price determined, like all other market prices, by the stock available (qualified by the anticipations of the stock likely to be available presently) and the nature of the services it can render. The power, then, of Governments to make their issues do exchange work depends on their power to make a note of a certain face value do a definite amount of exchange work; and this they can effect by giving it a definite primary value to certain persons, and then keeping the issue within the corresponding limits. It does not consist in an anomalous, and, in fact, inconceivable, power of enabling an indefinite issue to perform a definite work, and arriving at the value of each individual unit by a division sum. Indeed, this division sum is impossible in any case to make; for the proposed divisor is arrived at by multiplying the number of units in the face value of the issue by the rate at which, on an average, they circulate. Now the Government can undoubtedly regulate the amount of the issue, but it cannot regulate the average rate at which the units will circulate. Nor indeed can it rely on the dividend, namely the amount of business which the circulating medium shall perform, remaining constant. For it is a matter of convenience how much of the business of a country shall be carried on by the aid of a circulating medium and how much without it; and as a matter of fact, at periods when there is a dearth of small change in a country a great amount of retail business is conducted on account, and balances are more often settled in kind. Thus business which would ordinarily have been carried on by the circulating medium is carried on without it, because of its rarity. In Italy, for instance, when coppers were rare the exchange value of a copper did not rise because a smaller number had to do a greater amount of work, but each unit did as much business as it could, and the rest of the business was done without them. Again, the history of paper money abounds in instances of sudden changes, within the country itself, in the value of paper money, caused by reports unfavourable to the Government’s credit. The value of the currency was lowered in these cases by a doubt as to whether the Government would be permanently stable and would be in a position to honour its drafts, that is to say, whether, this day three months, the persons who have the power to take my goods for public purposes will accept a draft of the present Government in lieu of payment. It is not easy to see how, on the theory of the quantity law, such a report could affect very rapidly the magnitudes on which the value of a note is supposed to depend, viz. the quantity of business to be transacted and the amount of the currency. Nor is it easy to see why we should suppose that the frequency with which the notes pass from hand to hand is independently fixed. On the other hand, the quantity of business done by the notes, as distinct from the quantity of business done altogether, and the rapidity of the circulation of the notes may obviously be affected by sinister rumours. Two of the quantities, then, supposed to determine the value of the unit of circulation are themselves liable to be determined by it. Finally, I’ll just mention that in the Wealth of Nations Adam Smith off-handedly mentioned acceptability in payment of taxes as a condition for inconvertible money not to be worthless. So the lineage of the idea, despite its somewhat disreputable and unorthodox associations, is really quite impeccable. Is there any fundamental theoretical difference between how monetary policy worked under the gold standard and how monetary policy works today for a modern inflation-targeting central bank? I will just note parenthetically that being a Canadian and therefore likely having been spared from listening to seemingly endless soundbites of Newt Gingrich pontificating about “fundamental this” and “fundamental that,” and “fundamentally this” and “fundamentally that,” Nick obviously has not developed the sort of allergic reaction to the mere sound or appearance of that now hopelessly hackneyed word with which many of his neighbors to the south are now incurably afflicted. To attack the question, Nick starts with the most extreme version of the gold standard in which central bank notes are nothing but receipts for an equivalent amount of gold (given the official and unchangeable legal conversion rate between bank notes and gold. He then proceeds to relax the assumptions underlying the extreme version of the gold standard from which he starts, allowing central bank reserves to be less than its liabilities, then allowing reserves to be zero, but still maintaining a fixed conversion rate between central bank notes and gold. (Over 25 years ago, Fischer Black developed a theoretical model of a gold standard with (near) zero reserves. See his paper “The Gold Standard with Double Feedback and Near Zero Reserves” published as chapter 5 of his book Business Cycles and Equilibrium. Whether anyone else has explored the idea of a gold standard with zero reserves I don’t know. But I don’t dispute that a gold standard could function with zero reserves, but I think there may be doubt about the robustness of such a gold standard to various possible shocks.) From here Nick further relaxes the underlying assumptions to allow a continuous adjustment of the legal conversion rate between central bank notes and gold at say a 2% annual rate. Then he allows the actual conversion rate to fluctuate within a range of 1% above to 1% below the official rate. And then he allows the base to be changed while keeping any changes in the base unbiased so the expectation is always that the conversion rate will continue to rise at a 2% annual rate. Having reached this point, Nick starts to relax the assumption that gold is the sole standard, first adding silver to get a symmetallic standard, and then many goods and services to get a broad based standard from which a little addition and subtraction and appropriate weighting bring us to the CPI standard. Having gone through this lengthy step-by-step transformation, Nick seems to think that he has shown an identity between the gold standard and a modern inflation-targeting central bank. To which my response is: not so fast, Nick. What Nick seems to be missing is that a central bank under a gold standard is operating passively unless it changes its stock of gold reserves, and even if it does change its stock of gold reserves, the central bank is still effectively passive unless, by changing its holdings of reserves, it can alter the real value of gold. On the other hand, I don’t see how one could characterize an inflation-targeting central bank as acting passively unless there was a direct market mechanism by which the public forced the central bank to achieve its inflation target. If a central bank did not maintain the legal conversion rate between its bank notes and gold, it would be violating a precise legal obligation to engage in a specific set of transactions. Instead of buying and selling gold at $20.67 an ounce, it would be buying and selling at some other price. If an inflation-targeting central bank does not meet its inflation target, can anyone specify the specific transactions that it was obligated to make that it refused to make when called upon to do so by a member of the public? And this is aside from the fact that no one even knows whether an inflation targeting central bank is achieving or not achieving its target at the time that it is conducting whatever transactions it is conducting in pursuit of whatever goal it is pursuing. In short, an inflation-targeting central bank cannot be said to be operating under the same or an analogous set of constraints as a central bank operating under a gold standard, at least not under any gold standard that I would recognize as such. Three weeks ago, Stein Ringem, Professor of Sociology at Oxford University, wrote a rather smug op-ed piece in the Financial Times entitled “Time for economists to eat humble pie . . . again,” ridiculing all the economists who had been criticizing Mrs. Merkel for not being more forthcoming in negotiating debt relief for Greece and other over-indebted European countries, who had warned that the euro would collapse if Mrs. Merkel did not relent in her opposition to bailouts, proving her economist critics wrong. Rejoicing in Mrs. Merkel’s vindication, Professor Ringen let loose on her critics. Economists warned politicians not to dither. In the New York Times, Paul Krugman poured scorn over Europe’s politicians. The implication of these calls for bold action was simple: Greece was in effect bankrupt; governments, notably Germany, would one way or another have to pay up if they wanted to save the euro. Ms Merkel’s line was different. Yes, Greece was bankrupt, but the solution was that Greece would carry as much as possible of its own debt, that private bondholders would be made to write down as much as possible, with speculators punished, and that other governments and the European Central Bank would contribute as little as possible. Had the balance of opinion among economists prevailed, private bondholders, who had lent recklessly, would have been let off scot-free at European taxpayers’ expense. Why were so many commentators so careless? I have no problem with the “chief economists”, whose job is to protect the banking sector, but what about the independent academic economists? There was never a sovereign debt crisis. There were two separate problems. The Greek government had more debt than it could manage and would somehow have to default. No other European government had an unmanageable debt level but some, such as Italy and Spain, did not have the trend under control and were at risk of moving to an unsustainable level. The solution to that problem was not bailouts, which would have been counterproductive and benefited lenders too much, but pressurize these governments to get their own affairs under control. That is being achieved in Italy. Here is where Professor Ringem’s disdain for economics gets him into serious trouble. He is right that there was no debt crisis. Spain and Italy need to control and reform their finances, but that is not why interest rates on their 10-year notes have jumped more than 50 basis points in the three weeks since Ringem wrote his little paean to Mrs. Merkel. The real problem is that the European Central Bank, despite occasional signs of independence, remains firmly under Mrs. Merkel’s control, refusing to provide enough cash to the Eurozone economy to allow a real recovery to get started. As long as interest rates exceed the rate of growth of nominal GDP, the real debt burden in Europe will continue to increase, no matter how ruthlessly Mrs. Merkel inflicts austerity on the rest of Europe. The need to predict, a psychological urge in the economic tribe, led to the wildest warnings. Ms. Merkel’s genius was to see that serious problems are solved by hard work and that what is at its core political cannot be solved by technocratic fiat. . . While experts panicked, politicians kept their cool. No, serious problems are solved by clear thinking about their causes, and, once the causes are identified, taking the appropriate steps to counteract them. If the cause of an unmanageable debt burden is that nominal debt is growing faster than nominal income, the solution is to increase the rate of growth of nominal income until it is growing faster than nominal debt. So what we have seen was not pretty. But it has been political craftsmanship of the highest order. Government borrowing has not been discredited but chronic borrowing to fund consumption is hopefully on its way to becoming history. Nominal income fell in the Eurozone in the fourth quarter of 2011, the first time it fell since the second quarter of 2009, falling in Ireland, Italy, Malta, Netherlands, Portugal, and Spain. Some craftsmanship. Europe’s leading politicians have performed admirably. They have done their job by staying level-headed and trusting themselves. One lesson is clear: beware the experts who come bearing advice and in particular economic experts. No, the lesson that is clear is to beware of politicians and sociologists unable to grasp the laws of arithmetic and compound interest. Keynes was a close observer of the British and American economies in an era in which their depressions were wholly or largely monetary in origin – Britain’s slump in the late 1920s after the price of the British currency was raised in terms of gold, and America’s Great Depression of the 1930s, when the world was not getting growth in the stock of gold to keep pace with productivity growth. In both cases, there was a huge fall of the price level. Major deflation is a telltale symptom of a monetary problem. What Phelps unfortunately missed was that from 1925 to mid-1929, Great Britain was not in a slump, at least not in his terminology. Unemployment was high, a carryover from the deep recession of 1920-21, and there were some serious structural problems, especially in the labor market. But the overvaluation of the pound that Phelps blames for a non-existent (under his terminology) slump caused only mild deflation. Deflation was mild, because the Federal Reserve, under the direction of the great Benjamin Strong, was aiming at a roughly stable US (and therefore, world) price level. Although there was still deflationary pressure on Britain, the pound being overvalued compared to the dollar, the accommodative Fed policy (condemned by von Mises and Hayek as intolerably inflationary) allowed a gradual diminution of the relative overvaluation of sterling with only mild British deflation. So from 1925 to 1929, the British economy actually grew steadily, while unemployment fell from over 11% in 1925 to just under 10% in 1929. The problem that caused the Great Depression in America and the rest of the world (or at least that portion of the world that had gone back on the gold standard) was not that the world stock of gold was not growing as fast as productivity was growing – that was a separate long-run problem that Cassel had warned about that had almost nothing to do with the sudden onset of the Great Depression in 1929. The problem was that in 1928 the insane Bank of France started converting its holdings of foreign exchange into gold. As a result, a tsunami of gold, drawn mostly from other central banks, inundated the vaults of the Bank of France, forcing other central banks throughout the world to raise interest rates and to cash in their foreign exchange holdings for gold in a futile effort to stem the tide of gold headed for the vaults of the IBOF. One central bank, the Federal Reserve, might have prevented the catastrophe, but, the illustrious Benjamin Strong tragically having been incapacitated by illness in early 1928, the incompetent crew replacing Strong kept raising the discount rate in a frenzied attempt to curb stock-market speculation on Wall Street. Instead of accommodating the world demand for gold by allowing an outflow of gold from its swollen reserves — over 40% of total gold reserves held by central banks, the Fed actually was inducing an inflow of gold into the US in 1929. That Phelps agrees that the 1925-29 period in Britain was characterized by a deficiency of effective demand because the price level was falling slightly, while denying that there is now any deficiency of aggregate demand in the US because prices are rising slightly, though at the slowest rate in 50 years, misses an important distinction, which is that when real interest rates are negative as they are now, an equilibrium with negative inflation is impossible. Forcing down inflation lower than it is now would trigger another financial panic. With positive real interest rates in the late 1920s, the British economy was able to tolerate deflation without imploding. It was only when deflation fell substantially below 1% a year that the British economy, like most of the rest of the world, started to implode. If Phelps wants to brush up on his Hawtrey and Cassel, a good place to start would be here. Nick Rowe and I, with some valuable commentary from Bill Woolsey, Mike Sproul and Scott Sumner, and perhaps others whom I am not now remembering, have been having an intermittent and (I hope) friendly argument for the past six months or so about the “hot potato” theory of money to which Nick subscribes, and which I deny, at least when it comes to privately produced bank money as opposed to government issued “fiat” money. Our differences were put on display once again in the discussion following my previous post on endogenous money. As I have mentioned many times, my view of how banks operate is derived from one of the best papers I have ever read, James Tobin’s classic 1963 paper “Commercial Banks as Creators of Money,” a paper that in my estimation would, on its own, have amply entitled Tobin to be awarded the Nobel Prize. If you haven’t read the paper, you should not deny yourself that pleasure and profit any longer. A few months ago, I stumbled across the PDF version of one of the relatively obscure follow-up volumes to the Monetary History of the US that Friedman and Schwartz wrote: Monetary Statistics of the US: Estimates, Sources, Methods. Part one of the book is an extended discussion about the definition of money, presenting various historical definitions of money and approaches to defining money. I think that I read parts of it when I was in graduate school, perhaps when I took Ben Klein’s graduate class monetary theory. As one might expect, Friedman and Schwartz spent a lot of time on discussing a priori versus pragmatic or empirical definitions of money, arguing that definitions based on concepts like “the essential properties of the medium of exchange” (title of a paper written by Leland Yeager) inevitably lead to dead ends, preferring instead definitions, like M2, that turn out to be empirically useful, even if only for a certain period of time, under a certain set of monetary institutions and practices. In rereading a number of sections of part one, I was repeatedly struck by how good and insightful an economist Friedman was. Since I am far from being an unqualified admirer of Friedman’s, it was good to be reminded again that despite his faults, he was a true master of the subject. Gramley and Chase, in a highly formal analysis of monetary adjustments in the shortest of short periods (Marshall’s market equilibrium contrasted with his short-run and long-run equilibriua), discuss the definition of money only incidentally. Yet their analysis qualifies for consideration along with the analyses of Pesek and Saving, Newlyn, and Yeager because, like the others, Gramley and Chase believe that far-reaching substantive conclusions about monetary analysis can be derived from rather simple abstract considerations and like, Newlyn and Yeager, they put great stress on whether the decisions of the public can or do affect monetary totals. That “the stock of money” is “an exogenous variable set by central bank policy,” they regard as one of the “time-honored doctrines of traditional monetary analysis.” They contrast this “more conventional view” with the “new view” that “open market operations alter the stock of money balances if, and only if, they alter the quantity of money demanded by the public. In a footnote to this passage, Friedman and Schwartz add the following comment (p. 124). In this respect [Gramley and Chase] follow James Tobin, “Commercial Banks as Creators of ‘Money.'” . . . Tobin presents a lucid exposition of commercial banks as financial intermediaries with which we agree fully and which we find most illuminating. His analysis, like that of Pesek and Saving, Newlyn, and Yeager, and as we shall note, Gramley and Chase, demonstrates that emphasis on supply considerations leads to a distinction between high-powered money and other assets but not between any broader total and other assets. Unlike Gramley and Chase, Tobin explicitly eschews drawing any far-reaching conclusions for policy and analysis from his quantitative analysis. This approach is an appropriate theoretical counterpart to an analysis of changes in income and expenditure along Keynesian lines. That analysis takes the price level as an institutional datum and therefore minimizes the distinction between nominal and real magnitudes. It takes interest rates as essentially the only market variable that reconciles the structure of assets supplied with the structure demanded. In a footnote to this passage, Friedman and Schwartz add this comment. It is instructive that economists who adopt this general view write as if the monetary authorities could determine the real and not merely the nominal quantity of high-powered money. For example, William C. Brainard and James Tobin in setting up a financial model to illustrate pitfalls in the building of such models use “the replacement value of . . . physical assets . . . as the numeraire of the system,” yet regard “the supply of reserves” as “one of the quantities the central bank directly controls (“Pitfalls in Financial Model-Building,” AER, May 1968, pp. 101-02). If the nominal level of prices is regarded as an endogenous variable, this is clearly wrong. Hence the writers must be assuming this nominal level of prices to be fixed outsider their system. Keynes’ “wage unit” serves the same role in his analysis and leads him and his followers also to treat the monetary authorities as directly controlling real and not nominal variables. But there is no logical necessity that requires the New View so elegantly formulated by Tobin to be deployed within a Keynesian framework rather than in a non-Keynesian framework in which some monetary aggregate, like the stock of currency or the monetary base, rather than M1 or M2, is what determines the price level. The stock of currency (or the monetary base) can function as the hot potato that determines (in conjunction with all the other variables affecting the demand for currency or the monetary base) the price level. Denying that bank money is a hot potato doesn’t require you to treat the price level “as an institutional datum.” Friedman, almost, but not quite, figured that one out. During my little vacation recently from writing about monetary policy, it seems that there has been quite a dust-up about endogenous money in econo-blogosphere. It all started with a post by Steve Keen, an Australian economist of the post-Keynesian persuasion, in which he expounded at length the greatness of Hyman Minsky, the irrelevance of equilibrium to macroeconomic problems, the endogeneity of the money supply, and the critical importance of debt in explaining macroeconomic fluctuations. In making his argument, Keen used as a foil a paper by Krugman and Eggerston “Debt, Delevereging, and the Liquidity Trap: A Fisher-Minsky-Koo Approach,” which he ridiculed for its excessive attachment to wrong-headed neoclassicism, as exemplified in the DSGE model in which Krugman and Eggerston conducted their analysis. I can’t help but note parenthetically that I was astounded by the following sentence in Keen’s post. There are so many ways in which neoclassical economists misinterpret non-neoclassical thinkers like Fisher and Minsky that I could write a book on the topic. No doubt that it would be a fascinating book, but what would be even more fascinating would be an, explanation of how Irving Fisher – yes, that Irving Fisher – could possibly be considered as anything other than a neo-classical economist. At any rate, this assault did not go unnoticed by Dr. Krugman, who responded with evident annoyance on his blog, focusing in particular on the question whether a useful macroeconomic model requires an explicit model of the banking system, as Keen asserted, or whether a simple assumption that the monetary authority can exercise sufficient control over the banking system makes an explicit model of the banking sector unnecessary, as Krugman, following the analysis of the General Theory, asserted. Sorry, but I can’t resist making another parenthetical observation. Post-Keynesians, following Joan Robinson, rarely miss an opportunity to dismiss the IS-LM model as an inauthentic and misleading transformation of the richer analysis of the General Theory. Yet, the IS-LM model’s assumption of a fixed nominal quantity of money determined by the monetary authority was taken straight from the General Theory, a point made by, among others, Jacques Rueff in his 1948 critique of the General Theory and the liquidity-preference theory of interest, and by G.L.S. Shackle in his writings on Keynes, e.g., The Years of High Theory. Thus, in arguing for an endogenous model of the money supply, it is the anti-IS-LM post-Keynesians who are departing from Keynes’s analysis in the GT. Krugman’s dismissive response to Keen, focusing on the endogeneity issue, elicited a stinging rejoinder, followed by several further rounds of heated argument. In the meantime, Nick Rowe joined the fray, writing at least three posts on the subject (1, 2, 3) generally siding with Krugman, as did Scott Fullwiler and Randall Wray, two leading lights of what has come to be known as Modern Monetary Theory (MMT), siding with Keen. Further discussion and commentary was provided by Steve Randy Waldman and Scott Sumner, and summaries by Edward Harrison, John Carney, Unlearning Economics, and Business Insider. In reading through the voluminous posts, I found myself pulled in both directions. Some readers may recall that I got into a bit of a controversy with Nick Rowe some months back over the endogeneity issue, when Nick asserted that any increase in the quantity of bank money is a hot potato. Thus, if banks create more money than the public want to hold, the disequilibrium cannot be eliminated by a withdrawal of the excess money, rather the money must be passed from hand to hand, generating additional money income until the resulting increase in the demand to hold money eliminates the disequilibrium between the demand for money and the amount in existence. I argued that Nick had this all wrong, because banks can destroy, as well as create, money. Citing James Tobin’s classic article “Commercial Banks as Creators of Money,” I argued that responding to the interest-rate spreads between various lending and deposit rates, profit-maximizing banks have economic incentives to create only as much money as the public is willing to hold, no more and no less. Any disequilibrium between the amount of money in existence and the amount the public wants to hold can be eliminated either by a change (positive or negative) in the quantity of money or by a change in the deposit rates necessary to induce the pubic to hold the amount of money in existence. The idea stressed by Keen, Fullwiler and Wray, that banks don’t lend out deposits and hold reserves against their deposits, but create deposits in the course of lending and hold reserves only insofar as reserves offer some pecuniary or non-pecuniary yield is an idea to which I fully subscribe. They think that the money multiplier is a nonsensical concept, and so do I. I was actually encouraged to see that Nick Rowe now appears willing to accept that this is the right way to think about how banks operate, and that because banks are committed to convert their liabilities into currency on demand, they cannot create more liabilities than the public is willing to hold unless they are prepared to suffer losses as a consequence. But Keen, Fullwiler and Wray go a step further, which is to say that, since banks can create money out of thin air, there is no limit to their ability to create money. I don’t understand this point. Do they mean that banks are in a perpetual state of disequilibrium? I understand that they are uncomfortable with any notion of equilibrium, but all other profit-maximizing firms can be said to be subject to some limit, not necessarily a physical or quantitative limit, but an economic limit to their expansion. Tobin, in his classic article, was very clear that banks do not have an incentive to create unlimited quantities of deposits. At any moment, a bank must perceive that there is a point beyond which it would be unprofitable to expand (by making additional loans and creating additional deposits) its balance sheet further. Fullwiler argues at length that it makes no sense to speak about reserves or currency as setting any sort of constraint on the expansion of the banking system, ridiculing the notion that any bank is prevented from expanding by an inability to obtain additional reserves or additional currency should it want to do so. But banks are not constrained by any quantitative limit; they are constrained by the economic environment in which they operate and the incentives associated with the goal of maximizing profit. And that goal depends critically on the current and expected future price level, and on current lending and deposit rates. The current and expected future price level are controlled (or, at least, one may coherently hypothesize that they are controlled) by the central bank which controls the quantity of currency and the monetary base. Fullwiler denies that the central bank can control the quantity of currency or the monetary base, because the central bank is obligated to accommodate any demand for currency and to provide sufficient reserves to ensure that the payment system does not break down. But in any highly organized, efficiently managed market, transactors are able to buy and sell as much as they want to at the prevailing market price. So the mere fact that there are no frustrated demands for currency or reserves cannot prove that the central bank does not have the power to affect the value of currency. That would be like saying that the government could not affect the value of a domestically produced, internationally traded, commodity by applying a tariff on imports, but could do so only by imposing an import quota. Applying a tariff and imposing a quota are, in principle (with full knowledge of the relevant supply and demand curves), equivalent methods of raising the price of a commodity. However, in the absence of the requisite knowledge, if fluctuations in price would be more disruptive than fluctuations in quantity, the tariff is a better way to raise the price of the commodity than a numerical quota on imports. So while I think that bank money is endogenous, I don’t believe that the quantity of base money or currency is endogenous in the sense that the central bank is powerless to control the price level. The central bank may not be trying to target a particular quantity of currency or of the monetary base, but it can target a price level by varying its lending rate or by taking steps to vary the interbank overnight rate on bank reserves. This, it seems to me, is not very different from trying to control the domestic value of an imported commodity by setting a tariff on imports rather than controlling the quantity of imports directly. Endogeneity of bank money does not necessarily mean that a central bank cannot control the price level. If it can, I am not so sure that the post-Keynesian, MMT critique of more conventional macroeconomics is quite as powerful as they seem to think. Does the Value of Intellectual Property Reflect the Social or the Private Value of Information? A couple of weeks ago, and again last week, I suggested a reason why, despite the general proposition that non-lump-sum taxes are distortionary, reduced marginal tax rates since the 1980s could have slowed down US economic growth. In illustrating how this might have happened, I focused mainly on the growth of the financial sector, hypothesizing that investments by financial firms in “research” and in devising trading strategies are socially wasteful, because the return on those investments stems from trading profits reflecting not additions to output but transfers from other less knowledgeable and sophisticated traders. An article (“AOL Strikes $1.1 billion Patent Deal with Microsoft”) in today’s New York Times gives another illustration of this phenomenon, a difference in the social and private value of information, except that the difference between the social and private value of information in the AOL/Microsoft patent deal results not so much from the information as such, as from the creation of property rights in ideas, i.e., intellectual property, especially patents. AOL agreed on Monday to sell a portfolio of over 800 patents, and license about 300 more, to Microsoft for $1.056 billion, amid an arms race within the technology industry over intellectual property. Under the terms of the transaction, AOL will retain a license for the patents it is selling, while Microsoft will receive a nonexclusive license for the technologies AOL is retaining. It is the latest big deal for patents, at a time when tech companies are amassing intellectual property rights as ammunition against competitors. Last year, Google purchased Motorola Mobility for $12.5 billion, largely for its patent portfolio. And scores of companies, including Apple, Samsung, Facebook and Yahoo, are clashing in courtrooms over claims to technology underpinning some of the basic functions of smartphones and social networks alike. The deal will also provide AOL with some sorely needed cash as the struggling Internet company continues its attempt to refashion itself as a media content provider. AOL began shopping around the patents in the fall, in what it said was a “robust, competitive auction.” The results of the sale may be surprising to some analysts. Two weeks ago, an advisory firm estimated that the sale could yield as little as $290 million. “The combined sale and licensing arrangement unlocks current dollar value for our shareholders and enables AOL to continue to aggressively execute on our strategy to create long-term shareholder value,” Tim Armstrong, the company’s chairman and chief executive, said in a statement. The company said it would distribute a “significant portion” of the proceeds to restive shareholders, who have been awaiting positive results from the turnaround campaign from Mr. Armstrong. Among those investors is Starboard Value L.P., which currently owns a 5.2 percent stake. In a letter on Feb. 24, the investment firm wrote that it remained disappointed in AOL’s progress, and announced a slate of candidates for the company’s board. Shares in AOL leaped 35.6 percent, to $24.98, in premarket trading on Monday. They had fallen more than 8 percent over the last 12 months. AOL was advised by Evercore Partners, Goldman Sachs and the law firms Wachtell, Lipton, Rosen & Katz and Finnegan, Henderson, Farabow, Garrett & Dunner. Microsoft was advised by the law firm Covington & Burling. The main theoretical question posed in the production of knowledge . . . is how to bring about the correct amount of resources in the search for new knowledge. Does our present [published in 1968] patent system with its 17-year grant of exclusive possession of the knowledge bring forth approximately the right amount of research effort? We normally give perpetual possession of a piece of capital to its maker and his heirs. The reason is simple: the marginal social product is the sum of all future yields of the piece of capital, and if capital is to be produced privately to where its marginal social product equals its marginal cost, the owner must receive all future yields. Why not the same rule for the producer of new knowledge? The traditional formal answer, I assume, is that the new knowledge is usually sold monopolistically rather than competitively. The inventor of the safety razor does not have to compete with 500 equally attractive other new ways to shave, so he may charge a monopoly price for his razor. . . . Thus with a perpetual patent system too many resources would go into research and innovation. Stigler’s answer is correct, as far as it goes, but it doesn’t go very far. There is another, perhaps greater, problem with treating knowledge like a piece of physical capital than the one addressed by Stigler: it presumes that new knowledge created at time t would not have been created subsequently at any later date, say, time t+x. If the knowledge created at time t would, in any case, have been created subsequently at time t+x, then giving the inventor a perpetual right to the invention overcompensates him inasmuch as he contributed only x years, not an infinite length of time, to society’s use of the invention. The analysis is further clouded by the fact that every inventor faces uncertainty about whether he or some other inventor will obtain the patent for the invention on which he is working. The existence of patents creates countervailing incentives to engage in inventive activity. But the AOL/Microsoft patent deal illustrates another, wholly insidious, result of the explosion in intellectual-property enforcement, which is that patents have become weapons with which competitors in high-tech industries engage in a zero- (or even negative-) sum game of legal warfare with each other (“an arms race within the technology industry”). The resources devoted to the creation and protection of intellectual property are largely wasted, making it very questionable whether the benefits from encouraging investment in inventive and innovative activity that the patent system is theoretically supposed to encourage are now, in fact, greater than the value of resources wasted in the process of obtaining and using those right. In his seminal 1959 article on the Federal Communications Commission – how many people know that it was in this article, not the better known “The Problem of Social Cost” published the following year, that the Coase Theorem was first stated and proved? – Ronald Coase made the following incredibly important observation at the end of footnote 54 on p. 27. A waste of resources may result when the criteria used by courts to delimit rights result in resources being employed solely to establish a claim. So it seems that the current intellectual property regime is causing a substantial, perhaps huge, shift of resources from inventive activity, i.e., creating new and better products or creating new and less costly ways of producing existing products, to establishing claims to intellectual property that can then be used offensively or defensively against others (“amassing intellectual property rights as ammunition against competitors”). Such gains as are being generated from this kind of activity are, I conjecture, going disproportionately to those earning high incomes from intellectual property rights established through this costly process. The corresponding losses associated with creating intellectual property rights are probably distributed more evenly across individuals than the gains, so that the net effect is to increase income inequality even as the rate of growth in aggregate income and wealth is slowed down.